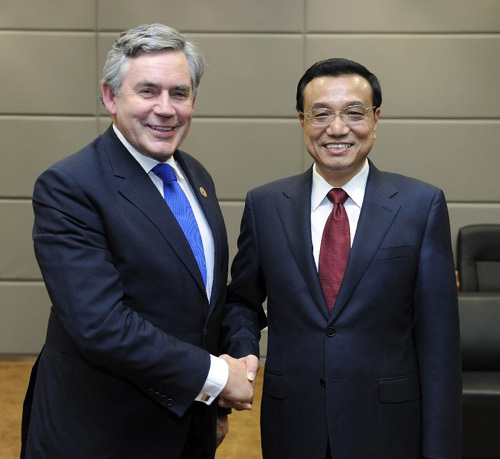 Li Keqiang welcomed Gordon Brown to China for the "Summer Davos" and appreciated his contribution to the growth of China-UK relations during his tenure as UK Prime Minister. Li Keqiang pointed out that China and UK are both permanent members of the UN Security Council as well as major countries of great influence. It is in the interest of both countries to further deepen bilateral cooperation and strengthen communication and coordination in international and regional affairs. He expressed the hope that both sides will truly respect each other's core concerns, enhance mutual trust and push forward China-UK relations on a sound track, and that Mr. Brown could keep on playing a constructive role to this end. Mr. Brown thanked the Premier for the meeting. He spoke positively of the achievements of China's reform and development and appreciated China's important contribution to the UN Millennium Development Goals. He pointed out that China's reform is good for global economic growth and financial stability, and should be supported by the international community. He will continue his efforts to promote friendly exchanges between the two peoples.